What are the benefits of emissions calculation and reporting? Between the Diesel scandal and the Paris Agreement, the last few years have been characterised by an increase of public scrutiny with regards to pollution control. What does this mean for the logistics sector? It means that more restrictive transport policies, especially regarding nitrogen and carbon emissions, are on the horizon. 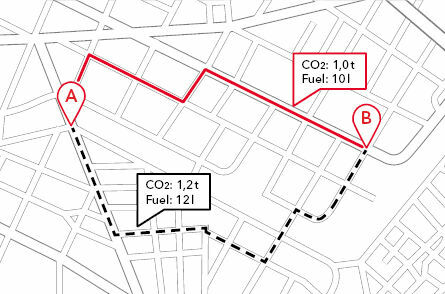 Curbing fuel consumption by optimising vehicle routing and minimising mileage is of course an integral part of reducing your fleet’s carbon footprint. However, we can expect more and more countries to implement mandatory emissions reporting programmes to systematically measure and monitor emissions. By then, the ability to accurately calculate and report all emissions, specifically CO2 and nitrogen, will become a deciding factor in your company’s success. Why work with the Emissions Calculation API by PTV xServer? The PTV xServer Emissions Calculation API is a software developer component, available as a cloud-based web service or an on-premise solution. Due to its standardised interface, the component can be easily integrated into an existing software architecture. It takes a wide range of relevant factors into account: Actual mileage, truck attributes, vehicle classes, fuel consumption, the load and further important conditions like the gradient of a route. It calculates your fleet’s emissions footprint based on relevant standards, such as HBEFA or CEN, and gives you a detailed and exact overview of your emissions. This way, you can be sure to be in line with current regulations – and prepared for stricter legislation in the future. Moreover, the demand for CO2-neutral products and services is steadily growing. Using the Emissions Calculator API by PTV xSercer enables you to tap into this attractive new market and offer green logistics to environmentally-conscious customers. Use the PTV xServer Emissions Calculation API to receive detailed information about energy usage, CO2, Methane and Nitrous Oxide. The French CO2 decree no. 2011-1336, Article L.1431-3:2011. The emissions calculation based on the Australian National Greenhouse Accounts (NGA), factors July 2011 and December 2015. The emissions calculation based on the emissions factors provided by the Department for Environment, Food & Rural Affairs in the United Kingdom, factors 2014 (UK DEFRA).